Philofaxy: Is it really made of leather? 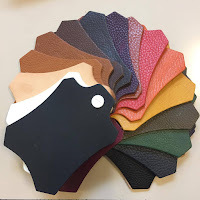 'It says it is made of leather' to which I would respond... "Yes but there is leather and there is leather"
I did some digging around and found the following definitions of the different types of leather that we find used in Filofax personal organisers. Full Grain Leather: leather which has not been altered beyond hair removal. Full grain leather is the most genuine type of leather, as it retains all of the original texture and markings of the original hide. Split Leather: leather made from the lower layers of a hide/skin that have been split away from the upper, or grain layers. Split leather is not as robust and full grain leather. Suede: is created from the flesh (inner) side of a hide, which is buffed to remove the surface and then flattened to create the suede effect. Suede refers to the process rather than the type of leather. Nubuc: is created using the grain (outer) side, giving it added strength and durability. It is buffed and brushed to create a soft, velvety effect. Aniline Leather: leather that is coloured with a transparent dye. The effect is applied by immersing the leather in a dye bath. Because the finish is transparent and shows the natural markings of the leather, only the best quality hides can be used. A lot of these different types of leather are used in a variety of products, not just Filofax personal organisers, so when it comes to care products you have plenty of products to choose from to keep your organiser soft and supple. Always check the instructions to ensure the care product you intend to use is suitable for the type of leather you have. If possible test it on a leather sample or on a part of your organiser that will not normally be visible in daily use.